Apple is planning to release at least three new iPhones next year, including a high-end model with a 5.5-inch-or-larger OLED display that is curved on both sides like Samsung's Galaxy S7 edge, according to Nikkei. The other two models are said to be 4.7-inch and 5.5-inch models with flat LCD displays like the iPhone 6s and iPhone 6s Plus, corroborating previous reports. The report reiterates that Samsung is expected to be Apple's primary supplier of OLED displays, but it may be unable to fully keep up with demand for both iPhones and its own Galaxy smartphones. Recognizing the opportunity, Apple manufacturer Foxconn has been developing glass casings and OLED displays over the past year, in hopes of securing orders from its biggest customer next year. Apple's widely rumored transition towards OLED in 2017 is requisite for curved displays, while the technology also provides improved contrast, faster response times, better viewing angles, better power efficiency for typical mixed image content, and other benefits compared to LCD technology. 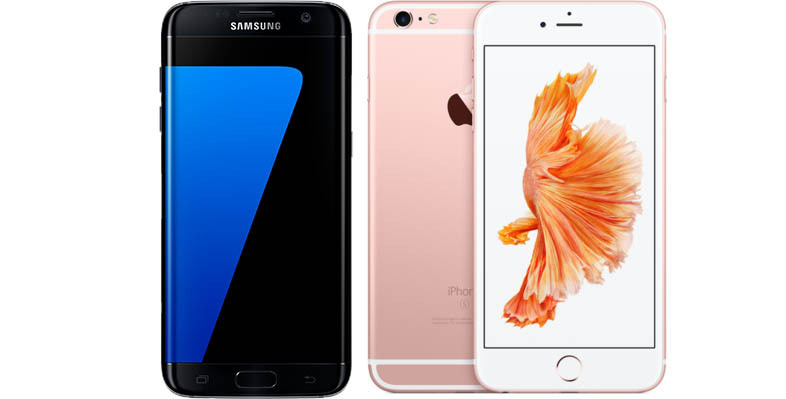 Samsung's Galaxy S7 makes a compelling case for Apple's rumored switch to OLED technology. Today's report corroborates KGI Securities analyst Ming-Chi Kuo, who earlier said Apple may launch an all-new iPhone with a curved 5.8-inch AMOLED display and glass casing in 2017. Kuo's research note outlined three new iPhone models, including LCD-based 4.7-inch and 5.5-inch models and a high-end OLED-based 5.8-inch model, as one possibility providing supply of AMOLED displays is sufficient. 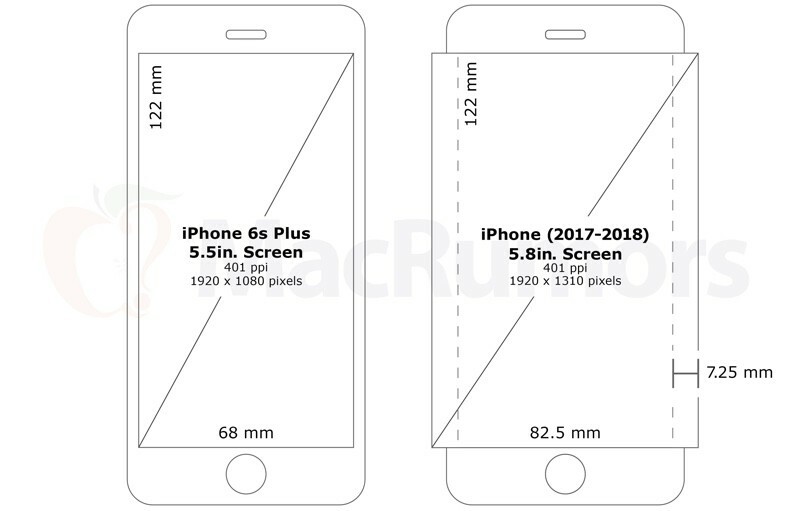 When applied to the height of an existing 5.5-inch iPhone, a 5.8-inch display like the one Apple is rumored to be working on would leave an extra 7.25mm of display on each side that could be used to wrap around the edges of the device. This would extend the display across the front and sides of the iPhone, perhaps enabling side-based gestures and buttons like on Samsung's Galaxy S7 edge. Apple was similarly rumored to be developing three iPhone models internally this year, but it reportedly scrapped plans to release a 5.5-inch model with a single-lens camera around six months ago. Apple's tenth-anniversary iPhone is shaping up to be a more significant upgrade, compared to the relatively incremental refresh expected from this year's tentatively named iPhone 7 and iPhone 7 Plus. I'm all for an OLED display, but what's the deal with a curved display? Just like the curved TV's, it seems awfully gimmicky to me. I don't understand this. Is the iPhone not a premium device already? If they do actually release a curved iPhone it'll be fascinating to see how many people on here suddenly change their opinion of how rubbish/pointless the S7 Edge is. It'll be "magical" when Apple does it, whereas it's a "gimmick" when Samsung does the same thing. And yet ... some of the apple fanboys on this site will still somehow twist this into an "Samsung is copying Apple" angle. They don't need to curve. they just need to get rid of the bezel. Put the touchid sensor under the screen and get rid of the home button. Use up all the available real estate before going to the edge gimmick. At least in my book that would be way better. Thankfully just a rumor. Even still, Like in the case of the Edge, I don't see any real use for a curved to the edge screen. It's innovation without a purpose (Just my opinion). The only thing I am really excited to potentially see, is the OLED screens. I really like that technology, and despite my having no issues with the current Apple displays. Naturally, only put the display in a giant phone and charge even more for it. Awesome. Hope this is wrong, I never want a iPhone 6 Plus sized display.